Gov. Brian Sandoval of Nevada is one of the high-ranking Republicans of color being showcased at the GOP convention this week. South Carolina Gov. 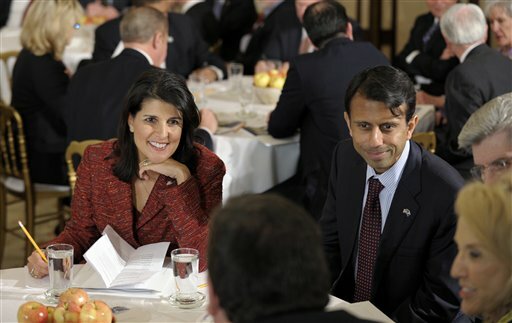 Nikki Haley, left, and Louisiana Gov. Bobby Jindal at a meeting of the National Governors Association in February. Once the GOP convention finally gets off the ground Tuesday, it will be a multicultural marvel that Democrats will be hard pressed to replicate. Oh, sure, the Dems have multi-culti prince Barack Obama, and they have the extra added attraction of an openly-lesbian congresswoman in Wisconsin’s Tammy Baldwin to kick things off. The Democrats also have keynoter Mayor Julian Castro and his fellow mayors Cory Booker, Michael Nutter, Antonio Villaraigosa and Anthony Foxx; California’s Attorney General Kamala Harris and Rep. Barbaba Lee; Illinois&apos; own Tammy Duckworth; and TV personalities Cristina Saralegui and Eva Longoria. But with the exception of Massachusetts Gov. Deval Patrick, the Dems won&apos;t be showcasing a lot of minorities who are in the major leagues as governors or U.S. senators. The ugly truth: There are no Democratic governors of color besides Patrick, and besides Daniel Inouye of Hawai&apos;i, who could put anyone to sleep, and New Jersey&apos;s Robert Menéndez in the senate, that cupboard&apos;s pretty bare too. Rubio — playing the Obama 2004 role — will introduce Mitt Romney as the party’s nominee on Thursday night. If that’s not arriving, I don’t know what is. Ted Cruz, the GOP senate shoo-in in Texas, will also speak. 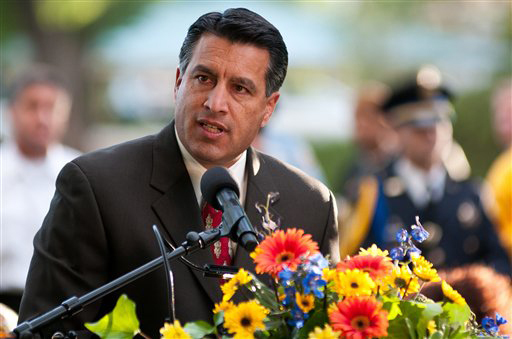 Then the GOP will roll out its parade of governors of color: Susana Martínez from New Mexico, Bobby Jindal of Louisiana, Nikki Haley of South Carolina, Luis Fortuño of Puerto Rico, and even pro-choice Brian Sandoval of Nevada. With the exception of Jindal and Fortuño, all have been elected since 2010. The two African-Americans on the sked — Condoleeza Rice and Saratoga Springs, Utah, Mayor Mia Love (also a Mormon!) — will be aiming less at blacks, with whom the GOP has zero chance, then at women. I’m not saying I agree with any of these folks about anything, except maybe with Sandoval and Rice on choice, but it’s objectively impressive that the Republicans — who have historically resisted civil rights and social change — can pull off that line-up while the Dems struggle to come up with a big name Latino to keynote. It’s also objectively true that the GOP platform does not represent the interests of Latinos or other minorities when it comes to education, healthcare and immigration, among the big issues for communities of color. But you can’t deny that the GOP has been smart in taking its very few minorities and elevating them super fast, positioning them for future minority votes. Some of these GOPers may not have much substance, some may be shooting stars and some of their stands may not represent their ethnic communities. And, of course, this rainbow of speakers will not be reflected in the overwhelmingly white audience that will go nuts for them. But right now it’s undeniable that, Obama aside, the GOP has the headliners.